"Thanks for the info on making creamed potatoes and peas! 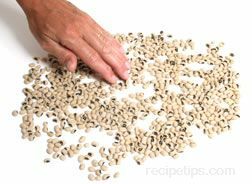 My grandma used to ... read full review"
Varieties of small round legumes that are typically classified as fresh, field or pod peas. The fresh pea is a small, round green vegetable, which is grown in a pod and is generally harvested in the early summer. The fresh pea is grown to be removed from the pod and eaten raw or cooked. Field peas, unlike fresh peas, are grown to be dried and then split or used whole for use in purées, soups and food dishes requiring thickening. Pod peas, such as the snow or sugar snap pea are grown to be eaten with both the pod and the pea together, either raw as a fresh pea or cooked. Peas can be eaten raw or cooked, which sweetens them slightly. Peas are eaten on their own as a vegetable dish or added to other vegetables, salads, stir-fries, savory dishes, soups, and stews. Peas can be used as a substitution in most recipes that call for green beans. Fresh peas may be found in the markets in the spring, but may be hard to find because they do not retain their freshness for very long. Snow peas are available throughout the year in supermarkets, produce markets, and Oriental markets. Sugar snap peas are available spring to fall. Frozen, canned, and dried peas are available year-round. Fresh peas: Select peas with smooth, bright green pods that contain a good number of seeds that are small in size. Pod peas: Select peas with bright green, crisp pods that are not damaged, soft or shriveled. Snow peas should have flat pods with tiny seeds that are barely visible. 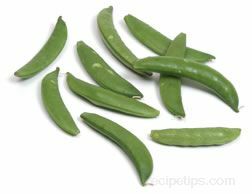 Sugar snap peas should have mature seeds that are large enough to make the pod appear bumpy. Peas are best eaten as soon as possible after they are picked. To store, place them in a container that is not airtight or place them in a perforated plastic bag. They can be refrigerated for 3 or 4 days. The longer they are refrigerated the less sweet they will be. Do not leave peas out at room temperature. Place whole or split dried peas in an airtight, glass container and store in a cool, dry dark place. The fresh pea is a small, round green vegetable, which is grown in a pod and is generally harvested in the early summer. Also known by other names such as sweet pea, green pea, garden pea, or English pea, the fresh pea is grown to be removed from the pod and eaten raw or used as an ingredient to be added to salads, soups, stews, casseroles, and other dishes. Fresh peas are available as a raw podded pea, canned as a shelled pea and frozen. 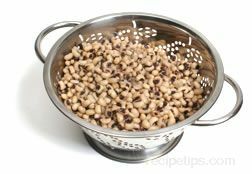 Field peas differ from fresh peas in that they are grown to produce a dry shelled product that is used for human consumption. They are also used as food for livestock. Varieties of the field pea include the green and yellow pea (either split or whole), the black-eyed pea, and the chickpea. 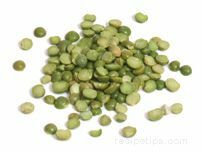 Unlike fresh peas, split peas are grown to be dried, shelled and then split or used whole for use in purées, soups and food dishes requiring thickening. It is an oval-shaped bean, ivory in color with a small black spot, referred to as the "eye." The "eye" is where the bean is attached to the pod and may also be yellow, brown or red in color. It has a pea-like flavor and a firm texture if not overcooked. This bean is also available as a fresh bean. It is be used in soups, side dishes and casseroles. 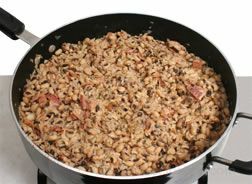 The southern states in America have a popular dish known as Hoppin' John that uses the cowpea as the key ingredient. 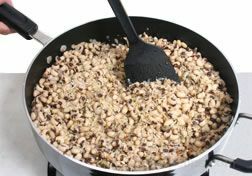 This bean is also known as a cowpea, or a black-eyed cowpea. A round, tan-colored bean with a slightly nutty flavor. It is used as an ingredient in soups, salads, side dishes, pasta dishes, and dips as a popular ingredient in Middle Eastern, Indian, Italian, Spanish, and Latin-American cuisine. It is also often roasted into a nut-like form and used as a snack and as and ingredient in the Middle Eastern dish, falafel. Dried or canned chickpeas are readily available in most food stores. Pod peas, such as the snow or sugar snap pea are grown to be eaten with both the pod and the pea together, either raw as a fresh pea or cooked. Pod peas are often served in salads, stir-fries, and Asian food dishes. Flat, edible, pea pods that contain tiny peas. The thin crisp pods from this vegetable are a bright green, turning a rich dark green when cooked. They do not require shelling but the string may need to be removed from the larger pods and the tips are generally snapped off. They are commonly used as an ingredient in Asian dishes. A flavorful vegetable that is a cross between snow peas and garden peas. The peas are eaten in the pods and do not require shelling. As the peas mature, the pod increases in size creating an irregular or lumpy appearance to the pod. Sugar snap peas have a crispy texture and a sweet flavor. They should be served raw or only cooked for a short time for them to retain their crispness. Also called "sugar peas." The firm but tender new shoots of the snow pea plant. The sprouts are eaten raw, steamed, stir-fried or added to soups. The sprouts will also produce succulent stems and leaves, known as snow pea leaves, which can be steamed or used in stir-frying. Snow Pea Leaves The tender leaves and tendrils, produced by the snow pea sprouts, which can be eaten raw, steamed or used in stir-fries. The delicate spiraling vines (shoots) and uppermost leaves of a young pea plant whose flavor is a cross between peas and spinach with a hint of watercress. Although Pea Shoots can be harvested from any variety of peas, the most commonly harvested are those from immature snow peas. They are added to stir-fries just before serving, sautéed as you would other greens in oil and seasonings, or they are served as fresh ingredients in salads. The Cantonese name for pea shoots is "dau miu". Pea shoots are available in Chinese markets in the spring. Place in a plastic bag and store in the refrigerator for one or two days. It is best when used the same day of purchasing. Do not wash until just before using. The different varieties of peas each require a little different preparation. They all require just a simple but thorough rinsing before any preparation begins. Once the peas have been rinsed, snap the top of the pod off and pull down to remove the string from the seam. Split the pod open by pressing on both sides of the seam with thumbs. Use your thumb to pop the peas out of the pod. The peas should not need to be rinsed. 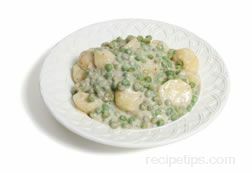 It is suggested by some that the peas be removed from the pods as soon as possible and that only the shelled peas be stored in the refrigerator if they are not to be eaten immediately. Do not clean and prepare peas until ready to use. Snow peas and sugar snap peas are meant to be eaten with the pod. 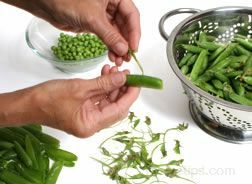 Rinse snow peas and sugar snap peas thoroughly. To prepare snow peas snap off both ends with a knife. The strings on the snow peas are not noticeable, so it is not necessary to remove them. 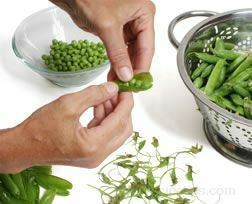 To prepare sugar snap peas, snap the stem end and remove the string from the inner side. 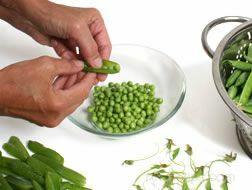 Rinse snow peas and sugar snap peas thoroughly before beginning preparation. Examine the peas to check for blemished areas. Some of these areas can probably be broken off and the remainder of the pea can be used. Discard the pea if the blemish makes the whole pea unusable. 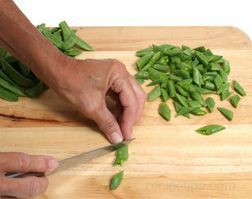 To prepare snow peas snap off both ends with your fingers or trim them off with a small knife. Sugar snap peas generally just need the stem end of the pod snapped off. The strings on the pod peas are not noticeable, so it is not necessary to remove them. You may find a few strings come off when snapping the end, so go ahead and remove them if the string comes off. 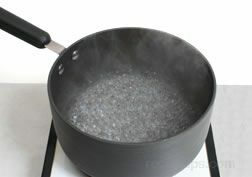 Add enough water to the saucepan so that it is below the bottom of the steamer basket when it is placed in the pot. 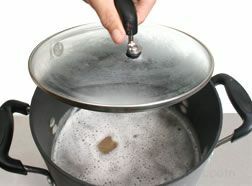 Bring the water to a full boil using a high heat. 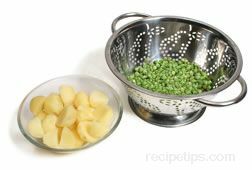 Place the fresh peas in the steamer basket and place the basket in the saucepan over the boiling water, making sure no water is coming up through the holes in the steamer. 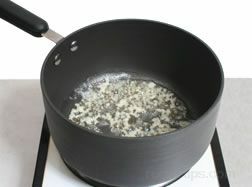 Place cover on saucepan and allow them to cook for 2 minutes. Peas should be crisp-tender when done and bright green in color. 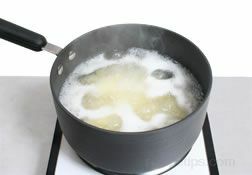 Remove the steamer basket from the saucepan. 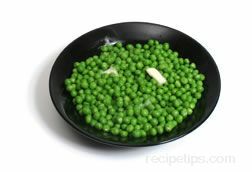 Pour peas into a serving bowl, season with salt and pepper, and add a little butter for extra flavor and serve while warm. 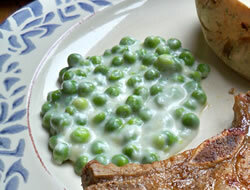 After steaming, the peas can also be add to other dishes as called for. 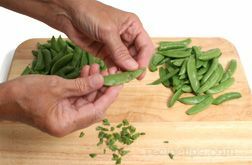 Sugar snap peas and snow peas can be steamed in the same manner as fresh peas. Steam for 2 to 3 minutes and then taste test for doneness. They should be crisp-tender and bright green in color. Do not overcook. After steaming, the pea pods can be seasoned and eaten on their own as a side dish or they can be added to other cooked dishes according to the recipe. Prepare peas as state above for the variety of peas being cooked. To boil 1 1/2 to 2 pounds of fresh peas or a 10 oz. package of frozen, bring 2 quarts of water to a boil in a saucepan. Add 3/4 tablespoon of salt. 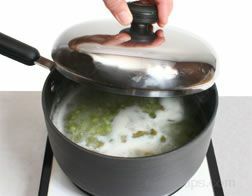 Drop in green peas and boil uncovered for 2 to 3 minutes Begin checking for doneness after 1 minute. 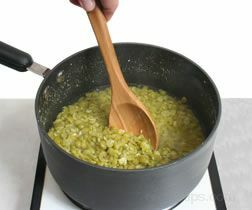 Remove some peas with a spoon and test for doneness, if not done, continue to cook for another minute and check doneness again. Do not overcook. 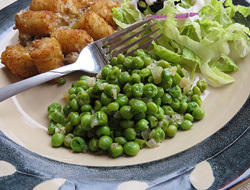 Peas should be crisp-tender and bright green in color. Do not cook sugar snap or snow peas for more than 1 minute or they will lose their crispness. 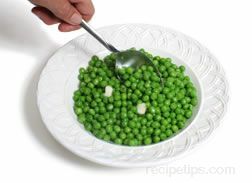 Drain the peas and then place them in a large skillet. 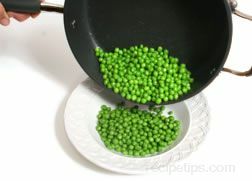 Toss the peas around in the skillet over high heat to dry the surface of the peas. This will take approximately 1 minute. Drying the surface will allow the butter to coat the surface of the peas better. 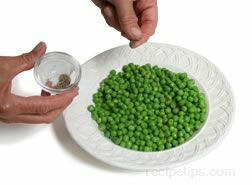 Remove the peas from the heat and pour into a serving bowl. Add the butter and toss to coat peas evenly. Salt and pepper the peas to taste and serve while still warm. Stir-frying is a common method of cooking snow peas and sugar snap peas. They can be stir-fried on their own or they can be added in a dish with other ingredients. 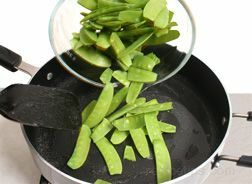 Snow peas and sugar snap peas cook very quickly so if they are being stir-fried with other ingredients, they should be added at the end of the stir-frying process. 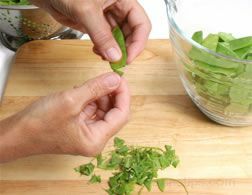 Shown below is a quick and easy method of stir-frying snow peas. Prepare 1 pound of snow peas as shown above. Dry peas thoroughly with a paper towel. 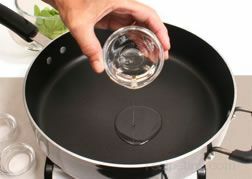 Pour 2 1/2 tablespoons of vegetable oil in a heated wok or large skillet with high sides. 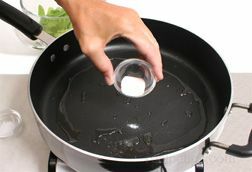 Allow the oil to get hot but do not allow it to smoke. Lower heat to medium and add 1/2 tsp. of salt and 1 tsp. of sugar to the hot oil. Quickly stir the salt and sugar in with the oil. 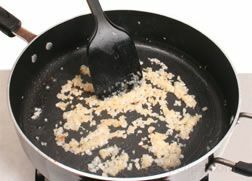 Do not try to dissolve the salt and sugar in the oil. 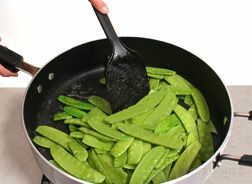 Add the snow peas to the hot skillet with the oil, salt and sugar. Stir the snow peas continuously. Stir-fry for about 1 minute. After stir-frying for approximately 1 minute, pour peas into a serving bowl and serve immediately while still hot. 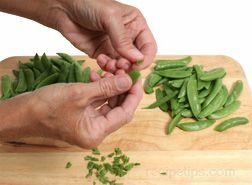 Note: This same method can be used to stir-fry sugar snap peas. 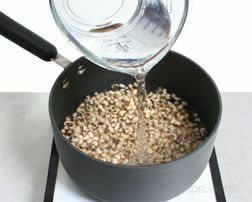 Dried peas must be soaked to make them soft and easier to cook. 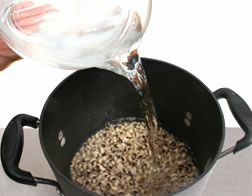 Soaking also helps reduce cracking and bursting of the skins while the beans are being cooked. Before soaking, check through the peas and remove any dirt or debris they may contain. 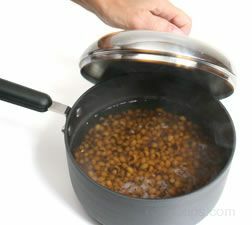 Whole dried peas must be soaked for 6 to 8 hours before cooking. 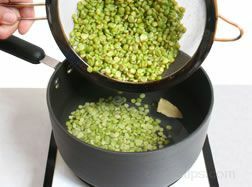 Split peas do not require soaking before cooking but they can be soaked for several hours to help reduce the amount of foaming that occurs during the cooking process. The peas will generally double in size after soaking. 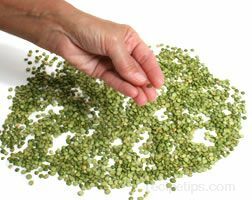 Prepare split peas by going through them and picking out any dirt or debris that is found. 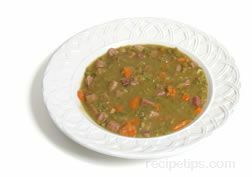 Split peas do not require soaking before cooking but they can be soaked for several hours to help reduce the amount of foaming that occurs during the cooking process. 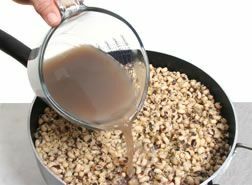 To soak: There are two methods that can be used to soak the dried peas. 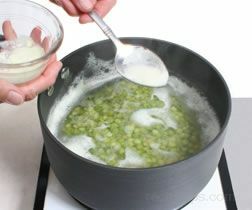 One is a long soaking method that requires the peas to be soaked for 6 to 8 hours. 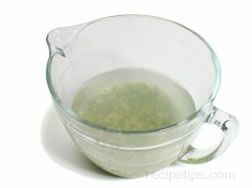 The other is a quick soak method that takes approximately 1 1/2 to 2 hours of soaking time. The two methods are shown below. Before soaking, check through the peas and remove any bad peas, dirt or debris they may contain. 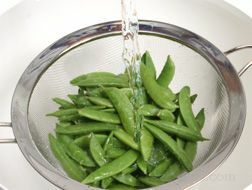 After the peas have been cleaned, place them in a large pot or bowl and cover with 2 to 3 times the volume of cool water. The peas should be allowed to soak for six to eight hours at room temperature. If they are going to soak overnight or longer than 8 hours, they should be refrigerated. 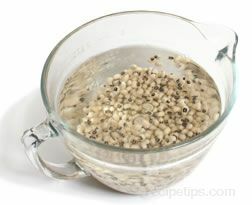 At least once during the soaking time, it is a good idea to pour off the water and add fresh. Pouring off the water the peas have been soaking in will help to get rid of some of the indigestible complex sugars that cause flatulence (gassiness). Pour off all the water from the beans when they are done soaking. Do not use this water to cook the beans. 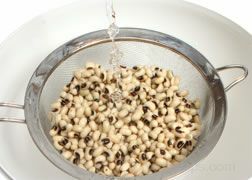 Place the beans in a strainer and rinse with cool water before cooking. Cook as instructed by the recipe. 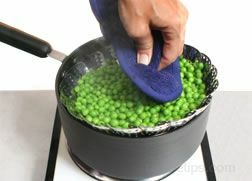 After the peas have been cleaned, place them in a large pot and cover with 2 to 3 times the volume of cool water. Over medium high heat bring the water to a boil. Boil for 2 minutes and then remove from the heat. Cover the pot and allow peas to stand for 1 1/2 to 2 hours. Pour off all the water from the peas when they are done soaking. Do not use this water to cook the peas. Pouring off the soaking water will help eliminate some of the indigestible complex sugars that cause flatulence (gassiness). 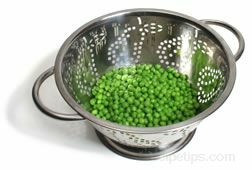 Place the peas in a strainer and rinse with cool water before cooking. Drain and then cook according to the recipe. 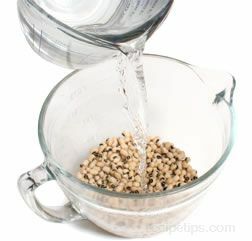 Prepare split peas as shown above. Soak if desired. 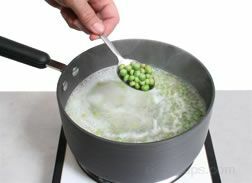 Rinse peas thoroughly, drain them and then place in a saucepan large enough to accommodate the swelling of the peas. Add 3 cups of water for each cup of peas. Bring the peas to a full boil over medium high heat. As the peas are being heated some foam may form on the surface. Skim the foam off as it forms. When the peas have come to a boil, reduce the heat to a simmer. Cover and allow the peas to simmer for one full hour. Stir the peas occasionally while simmering to prevent sticking. 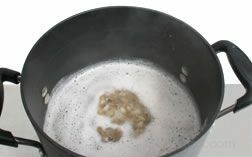 If the soup is becoming dry, add more water. 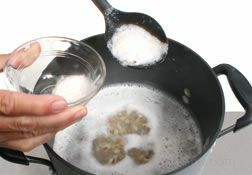 Add an additional 1/4 to 1/2 cup of water to start and then stir to see if more is needed. When the peas are done, finish according to the desired recipe. 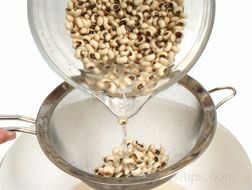 Prepare dried peas as shown above. 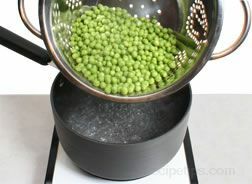 Add 4 cups of water per cup of peas to a large pot. Note: Do not add salt to the cooking water. Salt will toughen the peas and cause them to have to cook longer before they are done. Bring the peas to a gentle boil over medium high heat. As the peas are cooking, occasionally check for foaming. Skim foam off the surface when necessary. 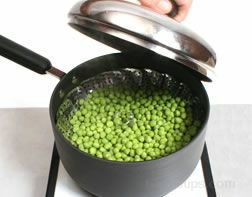 After the peas are boiling, reduce the heat to a simmer and cover. Cook until tender, approximately one hour. 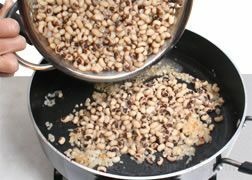 Once the dried peas are done, be sure to drain the cooking water to prevent them from overcooking and becoming mushy. 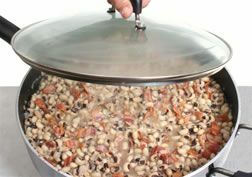 When the dried peas are done, they are generally added as an ingredient to another dish, such as soup and casseroles. 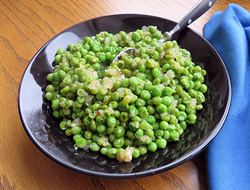 Peas can be used in many different types of salads and savory dishes. Recipes may call for the peas to be cook in some manner or just left fresh. Also, many recipes can use fresh or frozen peas interchangeably. 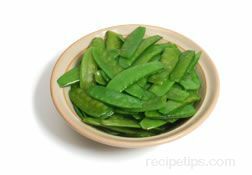 Most recipes that call for snow peas can also be prepared using sugar snap peas. Dried peas should not be substituted in recipes that call for green peas. Shown below are a few common recipes where peas are a main ingredient. Peel potatoes and cut any large potatoes in half. Place in a saucepan, cover with water and bring to a boil. Boil for approximately 10 minutes. Do not overcook. Note: The new potatoes can be cooked with the skins left on if desired. 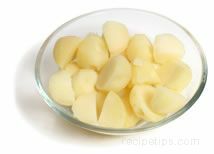 When the potatoes are done, drain the water off and set them aside. 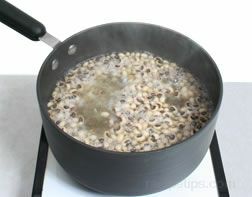 Boil the peas as shown above. Drain the peas when finished cooking and set aside with the potatoes. In a saucepan add the onion and butter. Cook until the onion is tender but hasn't browned yet. Add in flour, salt and pepper, and stir until mixed. 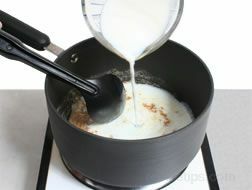 Add in all the milk and stir into flour mixture until all ingredients are well blended. 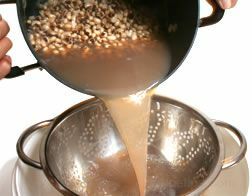 Continue to stir and cook until the mixture has thickened and begins to bubble. Cook for 1 more minute. 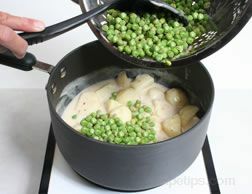 Add the potatoes and peas to the cream sauce. Stir until well distributed and thoroughly heated. 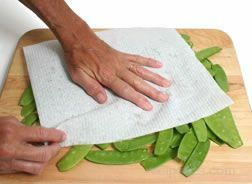 Clean and trim sugar snap peas as shown above and then cut into small diagonal pieces. 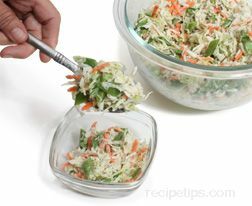 Prepare cabbage by cutting into thin slices unless you are using preshredded. 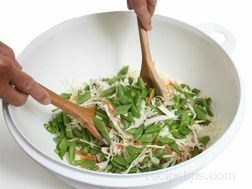 Toss the sugar snap peas and cabbage together in a bowl until evenly distributed. 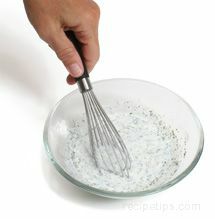 In another bowl, add the buttermilk (shake before adding), sour cream, dill, garlic, salt, pepper and vinegar. Whisk until all ingredients are well blended. 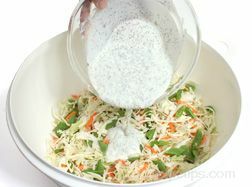 Pour dressing mixture over the sugar snap peas and cabbage. 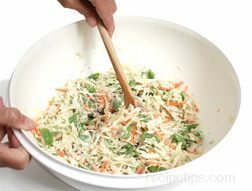 Stir mixture until peas and cabbage are evenly coated. 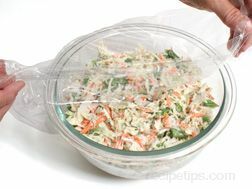 Cover with plastic or place in an airtight container and refrigerate until well chilled. Approximately 2 hours. Rinse peas thoroughly and then drain them. 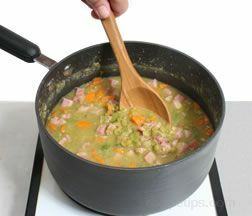 Combine the split peas, water, and bay leaf in a soup pot or a saucepan large enough to accommodate the swelling of the peas and the rest of the ingredients. 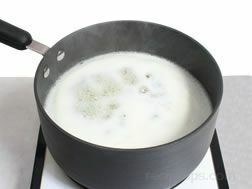 While soup is simmering, heat the oil in a medium skillet over medium high heat. 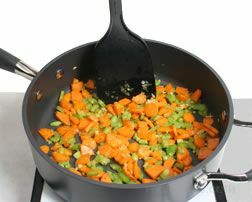 When oil is hot add onions carrots and celery. Sauté until vegetables begin to soften and onions are beginning to brown. Remove the sautéed vegetables from the skillet and set aside. 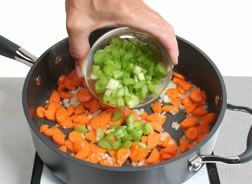 After the soup has simmered for an hour, remove the bay leaf and add the sautéed vegetables and the remaining ingredients. Continue simmering uncovered for at least another 30 minutes. Continue to stir occasionally as the soup simmers. 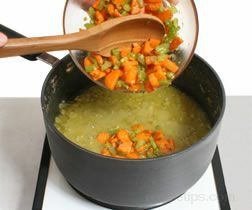 If the soup is thicker than desired, add a little more water. 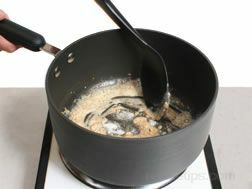 If it is too thin, continue to simmer until it is reduced slightly to thicken. When the soup is the desired consistency, taste to see if it needs additional seasoning with salt and pepper. Season to taste and serve the soup while still hot. 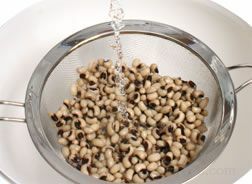 Soak the black-eyed peas using one of the methods shown above. 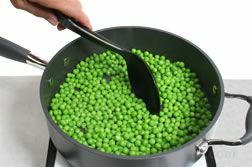 Place the peas in a large pot with 8 cups of water. 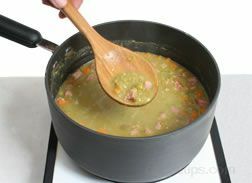 Over high heat, bring the peas to a boil and then turn the heat down to a simmer. Skim foam as needed. 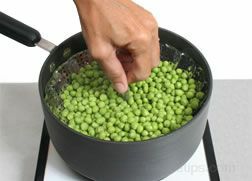 Cover the pot and allow the peas to cook for 45 minutes to an hour. Peas should be tender but not mushy. 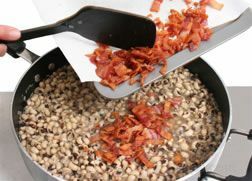 While the peas are cooking, cut the bacon into 1/2 inch pieces and fry until crisp. 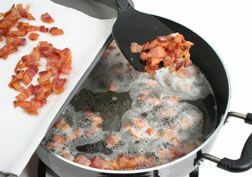 Remove bacon and place on a paper towel to drain grease. Pour off all the grease except for approximately 1 tablespoon. Add the onions to the bacon grease and sauté for 4 or 5 minutes over medium heat, stirring constantly. Cook only until soft and lightly browned. Set onions aside. When peas are done, pour off cooking liquid and reserve 2 1/2 cups of liquid. After the peas have drained, add them to the skillet with the sautéed onions. Pour in the reserved cooking liquid in with the peas and onions. Add the rice, thyme, pepper flakes, salt and pepper. Stir until all ingredients are evenly distributed. Add the bacon to the pea mixture and stir in well. Place over high heat and bring to a boil. Once it comes to a boil, turn the heat to low and cover the pan. 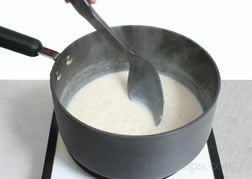 Cook at a simmer for 30 to 45 minutes until the rice is tender and the liquid has been absorbed. 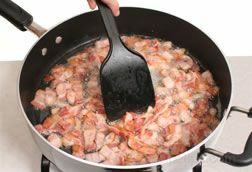 Turn the heat off and allow the skillet to sit for 15 minutes, covered, to allow the liquids to be absorbed. Remove the cover and serve while hot. 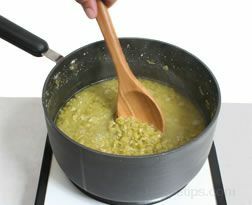 When cooking green peas, snow peas and sugar snap peas, drain the cooking liquid as soon as the peas are done so that they do not continue to cook. Experiment by leaving green peas in pods and add to stir fry. Add a mint sprig to water when steaming or boiling for added flavor. Add cold peas to lettuce salad to add fresh flavor to your salad. 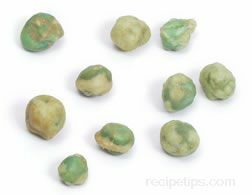 1 pound of green peas in the pods is equal to approximately 1 cup of shelled peas. 1 pound of pea pods is equivalent to approximately 4 servings. 1 pound of dried peas equals approximately 2 1/4 cups dry and 5 cups cooked. "Thanks for the info on making creamed potatoes and peas! My grandma used to make these all the time and it was such a treat. I can't wait to try making them myself. I am sure they won't be as good as grandma's but I am going to try."